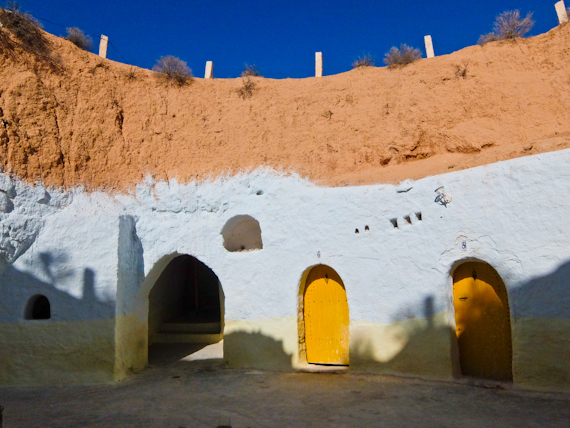 Rogue One was the movie event of 2016 for Star Wars fans, but you can still visit the locations for the earlier films in the South of Tunisia. Tozeur, an hour’s flying time from Tunis, is the archetypal desert oasis, home to over 400,000 date palms, and an impressive brick built Medina. Wandering round its narrow medieval alleys you get a sense of the importance of this town when it was the main cross roads between Africa and the Mediterranean. 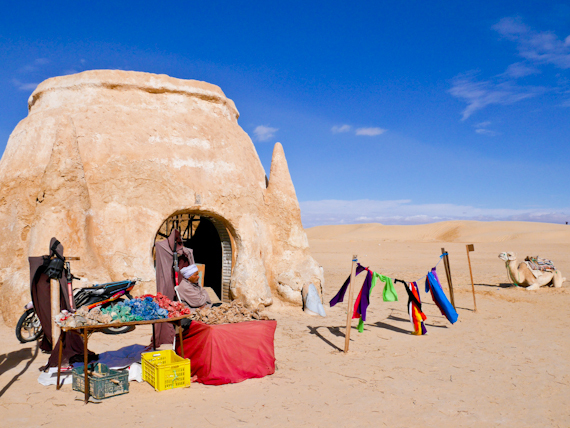 I’m here for the annual Festival of the Oasis which includes live music and daredevil stunt riding, but it’s also a good base if you’re setting out Star Wars hunting. 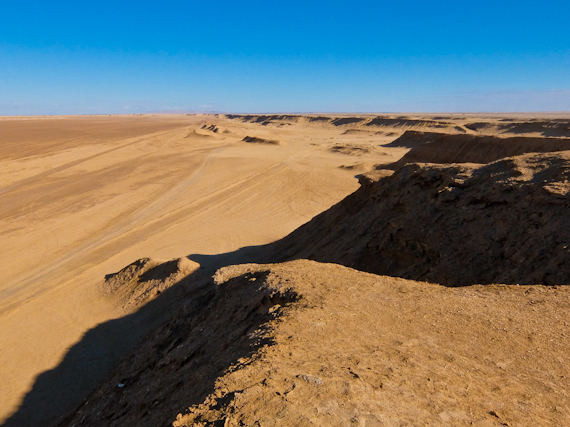 Other films have been shot in the area, notably the English Patient which built a hard packed sand road into the salty desert of Chott el Gharsa. It’s known as the Saul Zaentz Imperial Highway, after the film’s producer, and it leads me 50km from the nearest settlement to the Camel Head Rock or Onk Jemal. 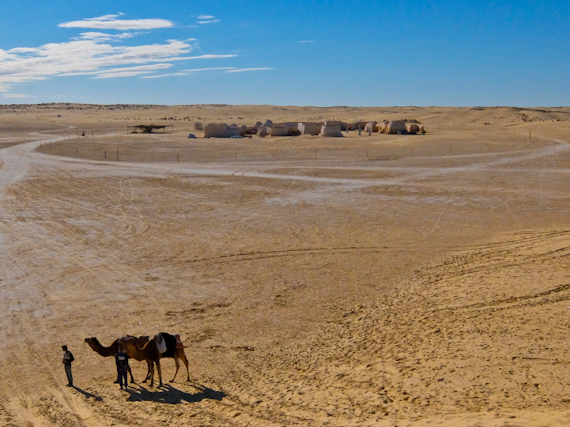 At its base is where the desert camp of Count Almásy was located and other desert scenes were shot nearby. Interestingly, Tunisia’s capital, Tunis, doubled for wartime Cairo, as too much had changed in Egypt for it to be shot there. George Lucas famously declared that Tunisia was the only place on earth to shoot the Star Wars series, and, from the top of the Rock, I look down on Mos Espa village, specially constructed for the Phantom Menace in 1997. I get confused about the chronology of the film but apparently this was where Darth Maul arrived on Tatooine and released the Sith Probes to search for Queen Amidala’s ship. The same location was used for Maul flying over the cliffs after he found Anakin and Qui-Gon, or so I’m told. Mos Espa village, after 20 years, looks remarkably intact, and I’m surprised to find nobody asking for money at the gates. In the streets you can see Watto’s Shop, Qui-Gon’s Alley and Sebulba’s Café, but, inside the buildings, it’s all decaying chicken wire, plaster and nails. After all this was built as a film set, not to last, although there are now plans for some restoration. 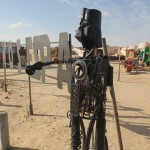 Outside the walls is the site of the famous Boonta Podracer course, although I couldn’t really make out anything. It’s all strangely beautiful, particularly at the end of the day when the sun is low, and well worth a visit. 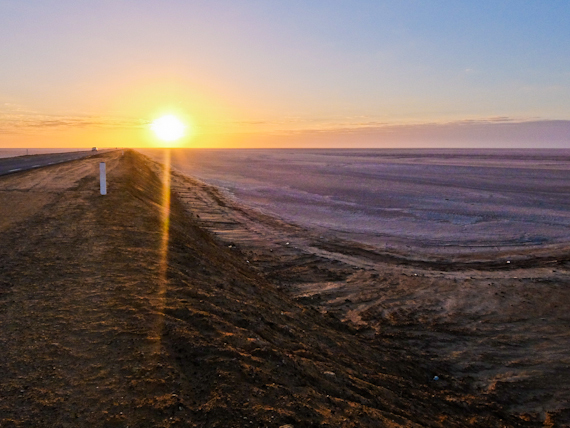 I’m anxious to see more so leave Tozeur and travel west, crossing the great salt lake of Chott el Jerid, where Luke Skywalker contemplated the two suns in the original movie. I don’t stop at the restored Lars homestead igloo, sitting in the middle of nowhere, as I’m on my way to Matmata, Skywalker’s home. This is one of the strangest places on earth, where people genuinely do live underground to shield themselves from the burning rays of the sun. There’s nothing on the surface but, as I get closer, I realise the desert is pierced by a series of huge pits. 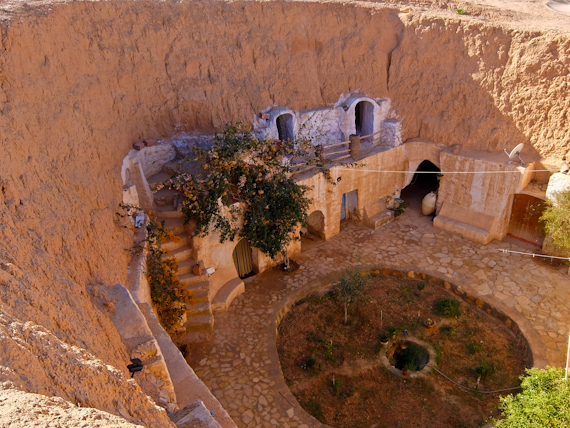 Each contains a courtyard, with garden and goats, and families live in cave rooms hollowed into the sides of the rock. 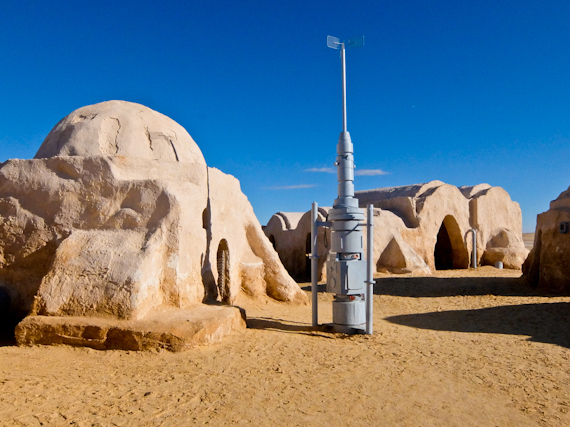 For Luke Skywalker’s home on the desert planet of Tatooine, (the real Tataouine is some miles south of the movie location), Lucas choose one of the inner courtyards of the Sidi Driss Hotel, where you see some of the set dressing from the movie. The dining chamber, where Luke argued with Uncle Owen over the fate of the Droids, is actually the hotel’s restaurant with the murals more or less intact. You can stay here, although these days it’s a bit run down, and you could bang your head on the low ceiling if you woke up with a start in the middle of the night. British tourists are fairly thin on the ground in Tunisia because of 2015’s terrorist incidents, although there are plenty of Russians. Since my last visit, there seems to be an increased police presence, manning checkpoints and also conducting searches at roundabouts. There are also comprehensive checks at hotel entrances and strict security at airports. The country really does seem to be suffering and needs more visitors. 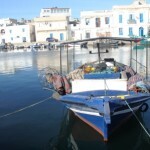 During my stay, I certainly felt completely at ease and would have no qualms about making a return visit. TunisAir flies to Tozeur via Tunis. Hotel El Mouradi makes a comfortable base in Tozeur. 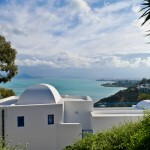 The Regency Hotel, in the Côtes de Carthage area, just outside Tunis, is handy for both the city and the airport. All images (c) Rupert Parker. Tunisia. Reinventing Itself once again.